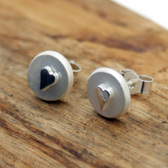 A cleverly designed pair of heart stud earrings from the Yulan range, they are based on the old noughts and crosses game. 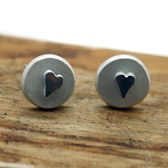 These sterling silver earrings feature a highly polished heart with a matt finish circle behind. They have butterfly fittings and are for pierced ears only. 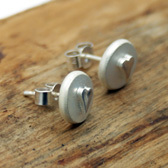 They are very pretty and will enhance any outfit and look equally elegant with evening wear.